Would you like to know what your website visitors are doing, where they come from, what they don't like about your website and what might cause them to spend some/more money with you? Get in touch with us to have a chat about where your best sources of information are and if we can help you find them, analyse them and optimise your marketing activities to get more sales. What would you do if you found out that 90% of website visitors to one page left your site once they'd looked at it? LifeinDanderyd.com has one blog post which does. What? Aren't we the experts in this so why do we have such a 'bad' page? The answer (thankfully) lies in the detail - in this case, who exactly is looking at that page in the first place? The visitors to this blog post are not our target market - they don't live or visit Danderyd - so we don't mind that they read the post and then leave! The featured company in the post had connections in Holland and the visitors - 90% of them - were coming from their own Facebook page and website. Their visits help the search engines see and like us but that they aren't looking through the rest of the website, who cares? So now we know. 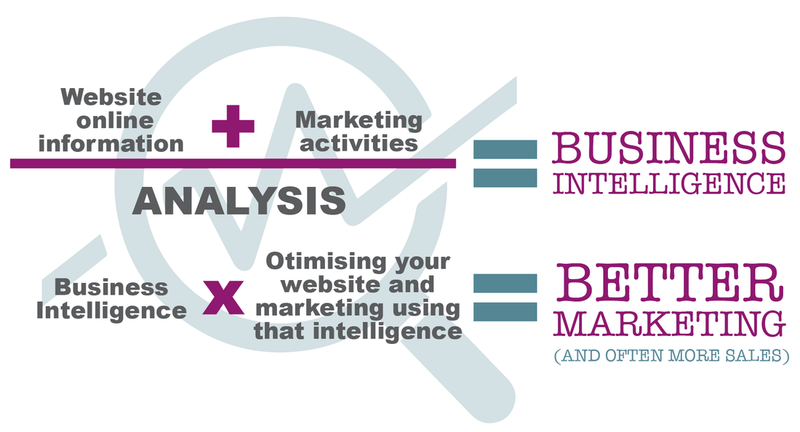 Using analytics helps us understand the 'why' of our visitors behaviour. Analysing the terms people search for to help the business react to changes in your potential customers' needs. Say you are a wine importer here in Sweden. How useful is it to your business to know at what times of year wine is most popular and how the longer-term interest is in wine? Using Google Trends data, we created this analysis chart that shows the amount of people searching for white wine and separately for red wine in Sweden over the last 7 years. It tells us that white wine is increasingly popular but that in November 2011 something happened that caused a spike in the interest of both - worth investigating to find out if it is something the business can cause again!